The founder of the Jesuits, St. Ignatius of Loyola, made multiple journeys through mainland Europe, all on foot and largely alone. He was the prototypical pilgrim and his experience was the inspiration for Brendan’s vocation as a Jesuit. Just like Ignatius abandoning his life as a courtier, Brendan left his lucrative but empty career in computers, attracted to this pilgrim ideal of Jesuit life. As for classic pilgrims, Jesuits are continually on the ‘road’, meeting people wherever they are gathered and sharing their concerns and issues. Ignatius was not an enclosed monk but a ‘holy itinerant’; he learned to trust in God’s providence and care, even though it meant exposure to the accompanying hardships and tribulations. Ignatius learned the necessity of ‘letting go, letting God’, trusting that things would work out, and handing over decisions and doubts. Ignatius wanted Jesuits in training to have a similar experience of this radical dependence on God, and designed a pilgrimage for Novices (those in their first two years) for the Jesuit Constitutions. In 1994 Brendan and his co-novice, Tony O’Riordan, walked 300 miles across north eastern Spain, begging for food and accomodation. Their adventures are recounted in the Way article, Ignatian Pilgrimage: The Inner Journey. This was a radical education in getting free of fear, learning to trust and relying on providence. Brendan lost a lot of weight but gained immeasurably in terms of understanding this ‘pilgrim God’ who met him on the road. This initial pilgrimage was the kernel for the idea of walking the Camino in 2011, twenty years later, and the foundational experience for the book. Faced with this devastating life event, it wasn’t surprising that Brendan sought answers on the Camino, where providence was paramount, where everything comes to the fore, and where healing is possible. The other key factor in Brendan’s Jesuit training was the landmark, month-long silent retreat, known as the Spiritual Exercises. Through this time of prayer and reflection Brendan learned to sift his experience, recognize God’s urgings and make decisions coherent with this. It was a serious injury that precipitated St. Ignatius’ awareness of his contrasting moods, and led to him uncovering God’s movements within him. Using this Ignatian system of examining moods, Brendan relates in the book’s first chapter how he was bereft and desolate, and how he needed to make a radical choice for action. Brendan’s own grief linked illness and resultant moods seemed to find an echo in Ignatius’ early experience: the answers were to be found through pilgrimage, self awareness and reflection. Similarly, Brendan had to choose between two stark choices, one life-giving and the other comfortable but stultifying. 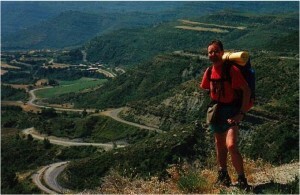 This choice for the challenge of the Camino led irrevocably to a journey or a quest. As soon as he was well, Ignatius the pilgrim limped his way to Jerusalem and into a new life. Ignatius formulated all his experiential wisdom on moods and decisions into a spiritual manual called the Spiritual Exercises, a supremely practical guide that Brendan uses extensively on the Camino. Ignatius had known great depression and desolation, and lived through his own ‘dark night’, and had even contemplated suicide once. Brendan’s own story and desire seemed to find a striking parallel in that of Ignatius. St. Ignatius’ idea was to create pilgrims, who are at home on the road, who can find God in the places and people that they meet, and who are reflective, discerning agents of God’s will in the world. World engaging and critiquing, they are imitating Christ in his ‘Way’ or Camino towards God. On the Camino, Brendan lived closely Ignatius’ ideal of being a pilgrim, open and trusting, like an instrument in the hands of God. In the book, Brendan comes to a new understanding; that God is pilgrim too, actively searching for him rather than being static, confined or rigid. In the dramatic climax to the book at Finisterre, Brendan is strongly challenged to let go of his burden, to find God in the painful but necessary letting go to permit real healing and reconciliation. This movement into spiritual freedom, the release from negative attachments, is what defines the final moment, something that has been slowly developing inside Brendan on the road and which comes to its unexpectedly joyful conclusion. Brendan returns home unburdened and experiencing real joy, an unfamiliar emotion since his brother Donal’s death. Learning from a 16th Century Basque has proved eminently useful. Renewal year; Spiritual Exercises, reflection, study and sharing.